Elusive and enigmatic, the African manatee faces threats that can only be mitigated when more is known about it. And therein lies the problem: resources for biologists in Africa are rudimentary, to say the least. Lucy Keith Diagne has set up a network to overcome the challenges they face. A juvenile manatee in N'dogo Lagoon, Gabon. The African manatee is so elusive that local people believe it is a magical spirit. It’s no wonder that many Africans think that ‘their’ manatee is a magical spirit, one they call Mamiwata. The animal is so elusive and lives in such remote, dark, muddy waters that it’s easy to see why it is often likened to an apparition. Just getting a glimpse of a nose or a tail is a rare surprise, and most people outside Africa have no idea that the species exists. 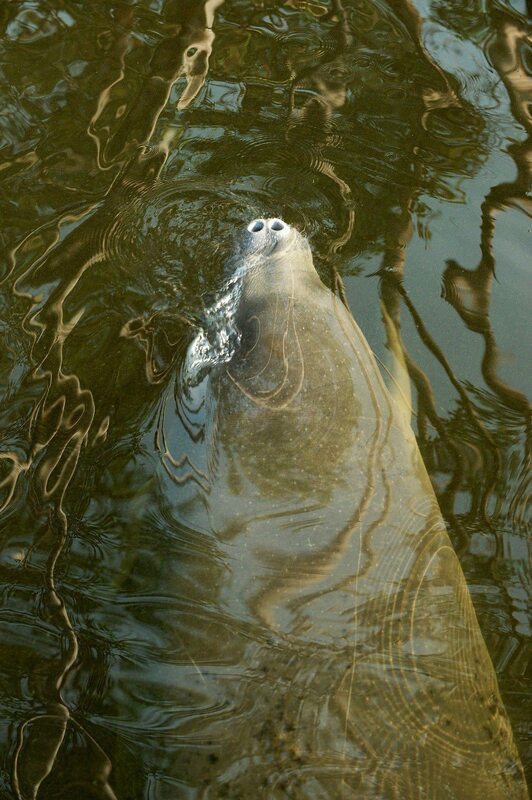 Although the African manatee Trichechus senegalensis looks much like its better-known cousin in Florida, it is generally smaller and has more protruding eyes. We know much less about the African manatee because not only is it more difficult to find and study in the wild, but also there are few resources for biologists in Africa to study it. The lack of research on this species compared to the other manatees has led to it being nicknamed ‘the forgotten sirenian’. According to the IUCN Red List of Threatened SpeciesTM, the African manatee is ‘the least studied large mammal in Africa’. For the past 10 years I’ve been trying to change that. But it hasn’t been easy. In addition to the challenges to studying them, the threats to African manatees are many. The animals are hunted, accidentally caught in fishing gear and trapped in dams and their habitat is being destroyed. Hunting is intensive in many places and manatee meat is openly sold in markets and restaurants, even though the species is legally protected in every country where it occurs. This is because the meat is considered a delicacy and is a traditional food item in many cultures. In Cameroon, for example, manatee is traditionally served at wedding feasts. Although there is a lot of legislation to protect the species – national laws in all countries where it occurs and listings on Appendix I of CITES (the Convention on International Trade in Endangered Species), CMS (Convention of Migratory Species) and the US Endangered Species and Marine Mammal Protection acts – there is little enforcement to deter poachers. Moreover, accurate numbers of manatees hunted and sold have barely been recorded, so there is no information available to compel wildlife law enforcement agencies to administer the laws. As for the other threats, there’s been almost no documentation of manatees caught incidentally in fishing nets or trapped in dams. 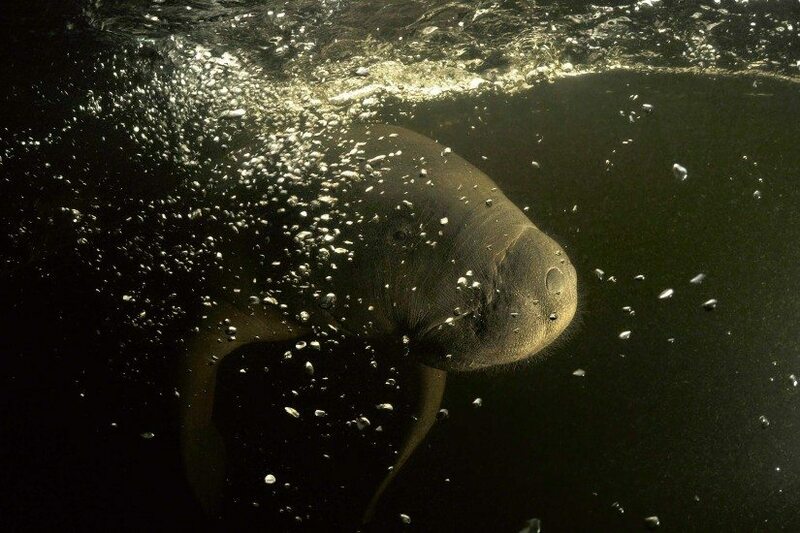 In recent times hydroelectric and agricultural dams have isolated manatee populations in many major waterways, including the Niger and Senegal rivers and Lake Volta in Ghana. Individuals have also been killed in the dam structures themselves, trapped or crushed in the gates. Another three huge, multi-purpose dams have been under construction along the Niger River since 2008, all of which will restrict manatee habitat further and lead to the genetic isolation of some populations. 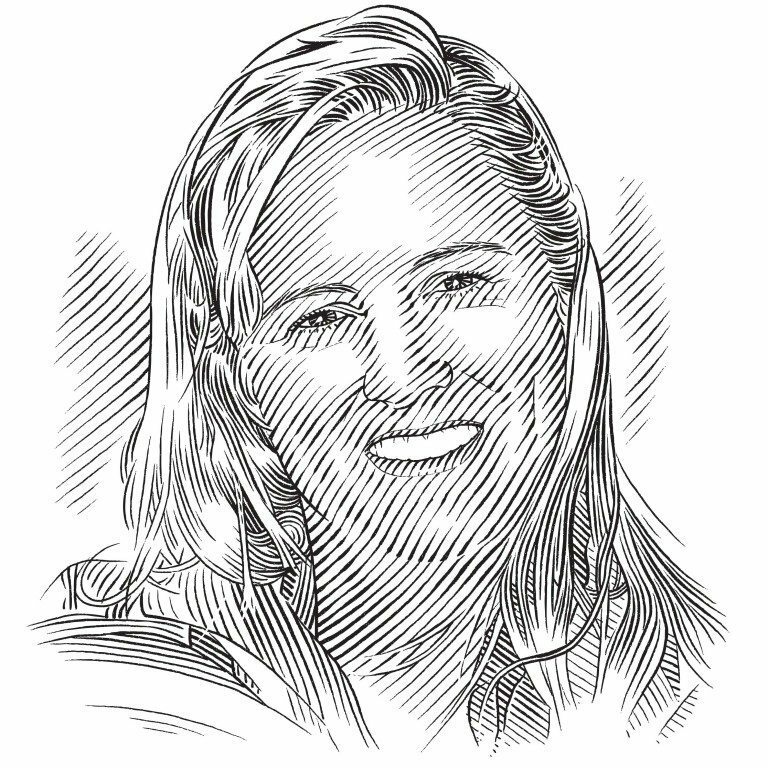 Since 2009, Dr Lucy Keith Diagne has been using stable isotopes to study the diet of the African manatee. 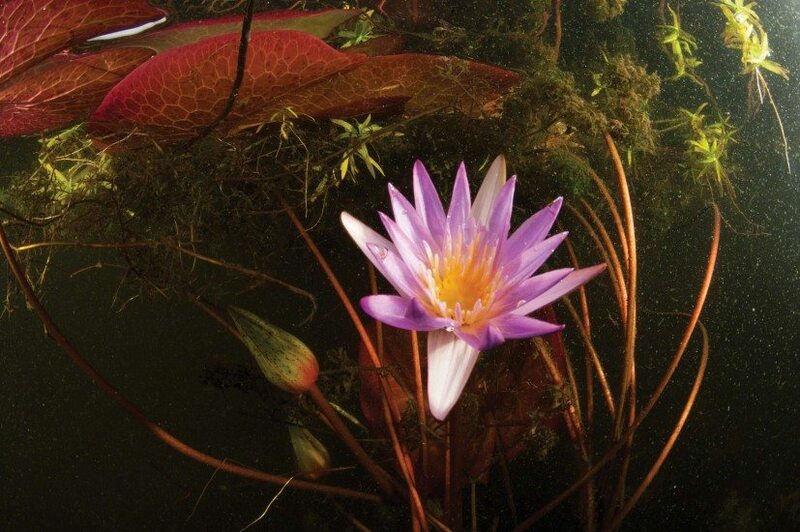 Unlike other manatee species, these animals regularly eat fish and molluscs in addition to more than 70 plant species, including (clockwise from top left) water lilies Nymphaea lotus, Najas pectinata, mangrove seeds Rhizophora racemosa, and African onion Crinum natans. Although the African manatee is difficult to study, there are some things we do know about it. Its range, larger than the area of continental USA, spans 21 countries on the western side of Africa, from the Senegal River at the southern border of Mauritania southwards along the Atlantic coast to the Longa River in central Angola. It also occurs up rivers extending more than 2,500 kilometres inland in countries such as Mali and Chad, and around tropical islands off the coast of Guinea-Bissau. It lives in a wide variety of ecosystems, from lagoons in lush equatorial rainforests to rivers at the edge of the Sahara Desert and other habitats in between. Its lifespan is at least 39 years. But we don’t know much else about its life history: how long a young calf is dependent on its mother, or when a manatee reaches sexual maturity and begins to reproduce, or even the size of an individual’s home range. When I started working with African manatees in 2006, there were only a handful of people already doing so – and more people who wanted to study them but didn’t know how to begin. So in 2008 I set about forming a collaborative network of African biologists and training its members to study manatees in the wild and address the threats throughout the species’ range. The network is growing and I am still providing practical training on how to find and study manatees and collect samples. I’m also donating field equipment, such as GPS units, binoculars and depth-sounders to researchers, and offering guidance on such things as the design of study plans and the writing of grant applications and reports. The goals of this regional network are to increase research on manatee ecology, physiology and behaviour; to share information; to conduct educational outreach; and to communicate the results of research to wildlife managers, the scientific community and the public at large. Network members include researchers who are affiliated to governments, universities and NGOs in 19 African countries, and the challenge today is to make their projects sustainable over the long term. Building and sustaining a range-wide effort of research, conservation, management, training and educational outreach will take many years to achieve, but a sense of community is reinforced by an online discussion group and partnerships between colleagues from neighbouring countries. Project collaborators share authorship on publications, which strengthens the network, gives recognition to their work within their home countries and, it is hoped, inspires further work. An African manatee in N'dogo Lagoon, Gabon, where sightings of the species are common. Elsewhere in Africa it is rarely seen. The large extent and the remoteness of the areas we cover mean that we must make the best use possible of the scientific tools and methods at our disposal in order to learn more about the ecology of the African manatee and estimate more rapidly the number of different populations in Africa, the sizes of these populations and the impact of hunting on them. All this additional knowledge will help us to conserve manatees in Africa. Genetic analysis is one such tool. It can determine the number, diversity and sizes of populations, as well as where distinct populations occur and where the boundaries of their ranges lie. Because low genetic diversity can signal both low population size and the long-term impact of hunting, genetic analysis can be very effective in the conservation and management of threatened species and populations. Physiology studies can also be very helpful, telling us about growth rates, longevity, disease and baseline health. Feeding ecology and migration patterns can be studied using stable isotopes, a tool that identifies what an animal has been eating over time. 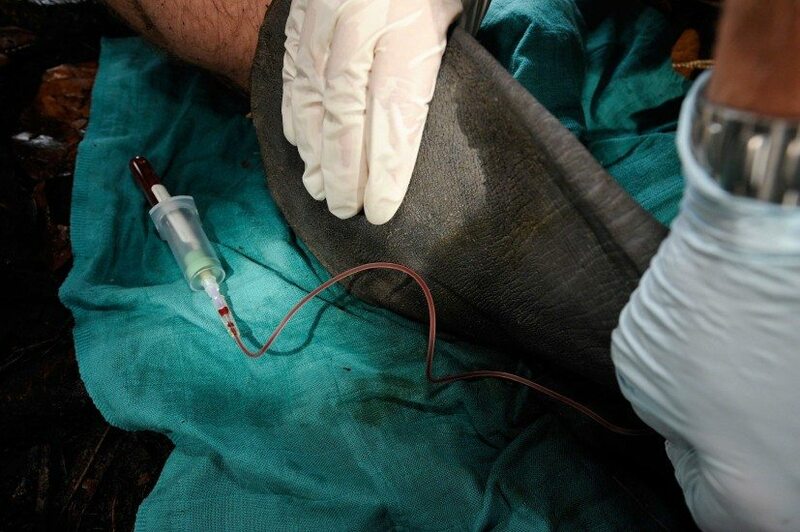 All these techniques are used regularly to study other animals, but have been widely applied to the study of African manatees only since 2009. The large number of threats to African manatees gives urgency to our work. The first priority is to understand how many unique populations of the species exist across its large range. It is not only a reduction in population size that makes a species vulnerable to extinction; its resilience is often determined by the strength of its genetic diversity – or how many distinct populations there are. Over 10 years my collaborators and I have collected 78 manatee samples from 12 countries in order to determine where distinct populations occur. 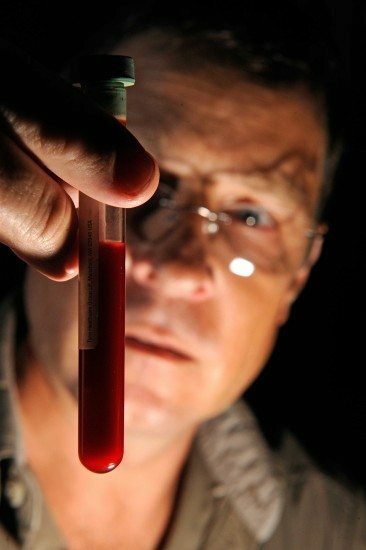 Through my genetics research I have identified 25 new mitochondrial haplotypes (these are unique versions of the same gene) for the African manatee – an exciting revelation because only five mitochondrial haplotypes had been known previously. These markers identified four separate populations: one in coastal West Africa (Senegal, Guinea and Guinea-Bissau); an inland population in the Senegal River; an inland Niger River population with samples coming from Mali, Niger, Chad and Cameroon; and a large population in the coastal rivers and lagoons of West and Central Africa (Ivory Coast, Ghana, Benin, Cameroon and Gabon). 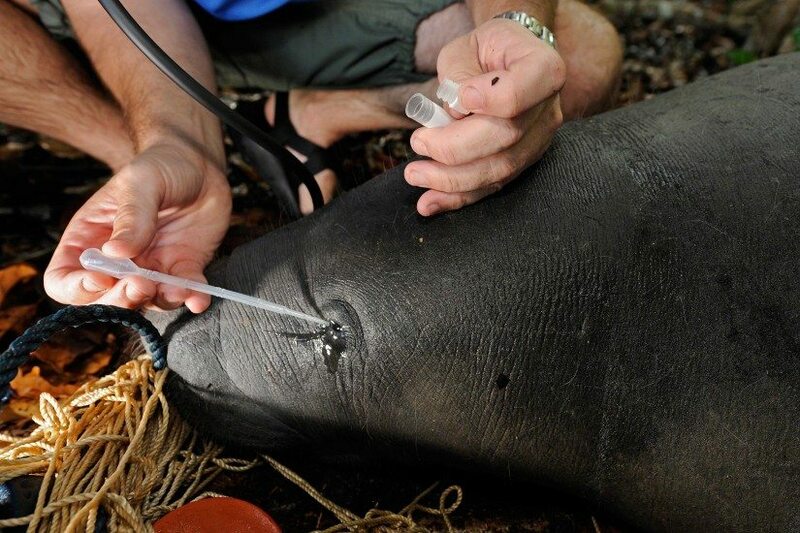 A captured manatee is monitored closely during sampling for a permitted research study at N'dogo Lagoon. This study is a first step, and with additional samples we will be able to continue defining more fine-scale population structure, both regionally and within specific countries. The results will aid conservation efforts by informing wildlife managers where unique populations exist, where they should focus trans-boundary conservation and management efforts – when populations cross borders – and where they need to assist specific isolated populations. The African manatee is also special in that it differs from other manatees by regularly feeding on fish and molluscs in addition to more than 70 species of plants. While working in Africa over the years, I was told by local people in many countries that manatees eat mussels, clams and fish – a diet very different from that of all other manatee species, which are considered to be strict herbivores. I heard these reports so often from people in countries thousands of miles apart that I decided I had to investigate. 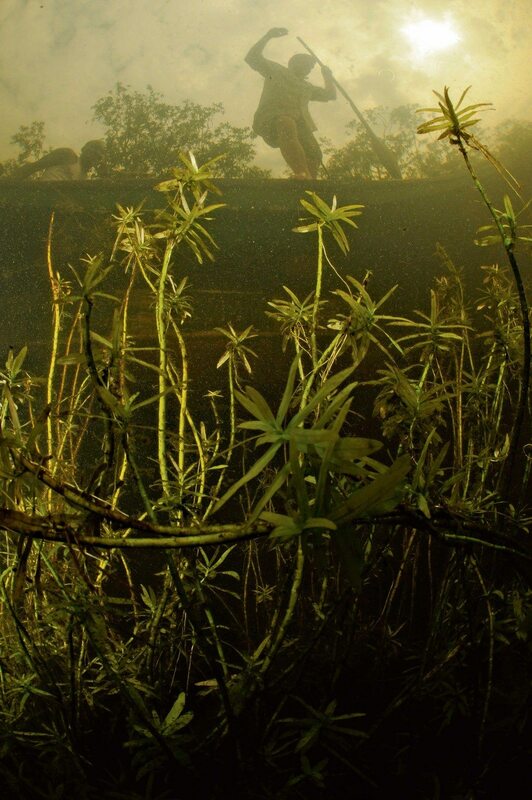 A manatee rises to take a breath in N'dogo Lagoon. Although there is a lot of legislation to protect the African manatee, including its listing in CITES Appendix 1, there is little enforcement to deter poachers. Recently, using the technique of analysing stable isotopes, I found that in Senegal manatees eat at least four species of fish as well as freshwater mussels and estuarine clams – food items that made up 50% of their diet! So, unlike the other two manatee species (the West Indian and Amazonian), African manatees have a varied, omnivorous diet. For a species previously considered to be a herbivore, this is pretty big news. But why is this important? This study gives us accurate information about the food items that manatees need, which can help managers to prioritise the protection of places where they are abundant. This new information also tells us which species we need to monitor as important food sources for manatees. As an example, now that we know that manatees in Senegal depend on molluscs and fish, we need to resolve conflicts with fishermen and help to conserve not just the plants the manatees eat, but all the food species they depend upon. This dietary analysis of African manatees in Senegal was the first for the species, and I look forward to understanding manatee diets in other countries. As African researchers begin studies in their home countries, many other, new research projects are taking shape as well. Studies of manatee habitat and distribution are under way in Senegal, the Gambia, Mali, Ghana, Benin, Nigeria, Cameroon, Gabon and Angola. At least 10 young African biologists are currently working on graduate degrees that focus on the distribution, physiology and behaviour of African manatees. In June 2015 I initiated an advanced two-year training and mentoring programme for eight researchers from Cameroon, Gabon and the Democratic Republic of Congo who are studying manatees in their countries, documenting the impact of illegal hunting and leading educational campaigns to raise awareness about the manatee’s protected status. 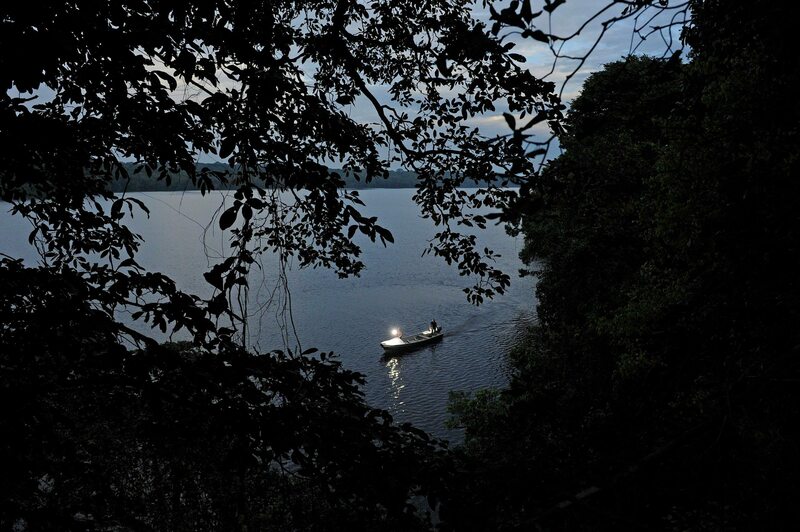 A fisherman can be seen above the water in N'dogo Lagoon. Lucy and her collaborators are working with West African communities to implement conservation programmes for the African manatee. For a long-term effort such as this, which is also operating on a continental scale, there will always be challenges. 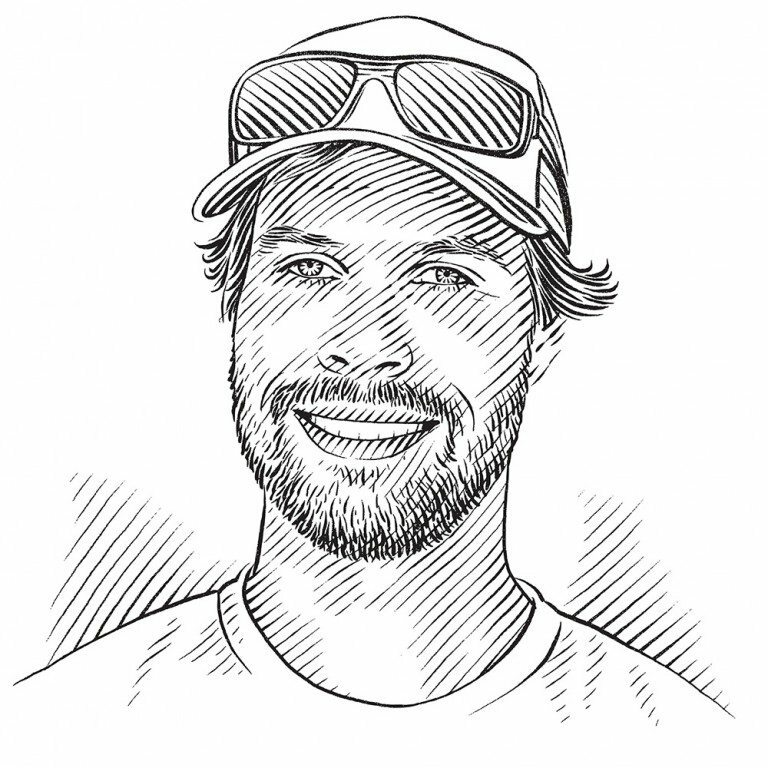 Manatee conservation programmes in Africa too often depend upon the work of specific individuals. We need more training and for efforts to be integrated into broader conservation programmes. More university-level students need to become involved and we need more laboratories for sample analysis. This species is likely to be conserved only through a network of localised, grassroot efforts by African researchers dedicated to long-term conservation and education in their countries – and we believe we’re off to a good start. The elusive African manatee, which arrived on the continent 3.5 to four million years ago, is an important part of many ecosystems in Africa and deserves to be protected. I hope that one day people around the world will know about – and will want to help conserve – this unique marine mammal that has inspired the myth of Mamiwata across Africa. After a long day waiting to catch manatees for their study, veterinarian Ken Cameron and lead scientist Lucy Keith Diagne return to camp without deploying a satellite tag on a manatee. Catching the elusive African manatee requires a lot of time and patience, but it's worth it to better understand this fascinating animal. In addition to conducting research projects, the manatee network has initiated several promising new conservation efforts in recent years, including three in Senegal, Mali and Nigeria. At Lake Guiers, a manatee hotspot in Senegal, local communities have got together to create and administer a natural reserve. Tocc Tocc is the first protected area established specifically for African manatees. Community leaders from five villages in northern Senegal worked together to form a conservation committee and draw up regulations for the protected area on Lake Guiers, which is recognised by Senegal’s National Parks Ministry and by the Ramsar Convention as a Wetland of International Importance. Twenty eco-guards, who act as rangers, have been hired from the five villages and trained to conduct regular patrols and enforcement, as well as collect data on manatees and other wildlife using the refuge. Tocc Tocc sells collection permits for several species of plants in the reserve and is now being developed as an ecotourism site in order to become self-sustaining. 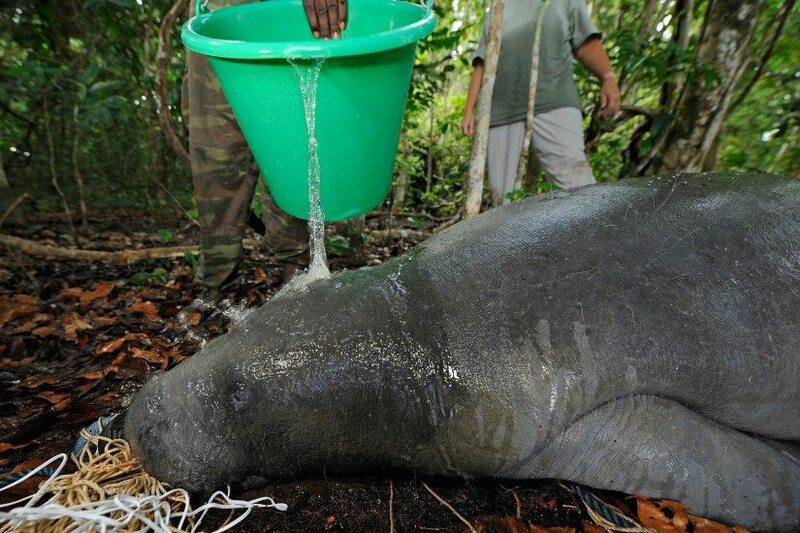 In central Mali, researcher Soumaile Berthe is working with seven communities along the Bani and Niger rivers to establish protected areas for manatees and encourage participation in ‘Friends of the Manatee’ clubs. 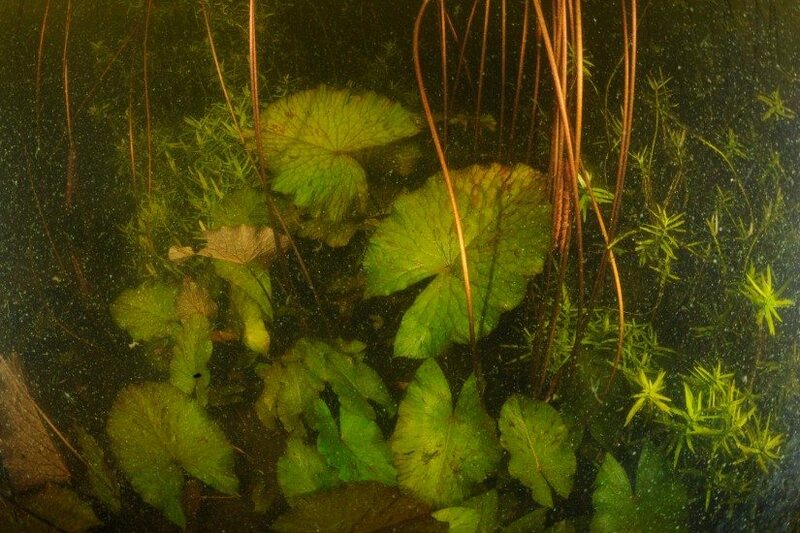 These clubs now have more than 500 members, who harnessed public support to create five small protected areas near villages, including an important freshwater spring where manatees come to drink. At Nigeria’s Lekki Lagoon outside Lagos, manatee researcher Dunsin Bolaji offered manatee hunters an alternative, proposing that if they gave up hunting and removed all their traps, he would teach them how to breed and raise catfish. He would also supply them with all the equipment and juvenile fish they needed to get started. At first the hunters were sceptical, but a few decided to try and the programme has become wildly successful. 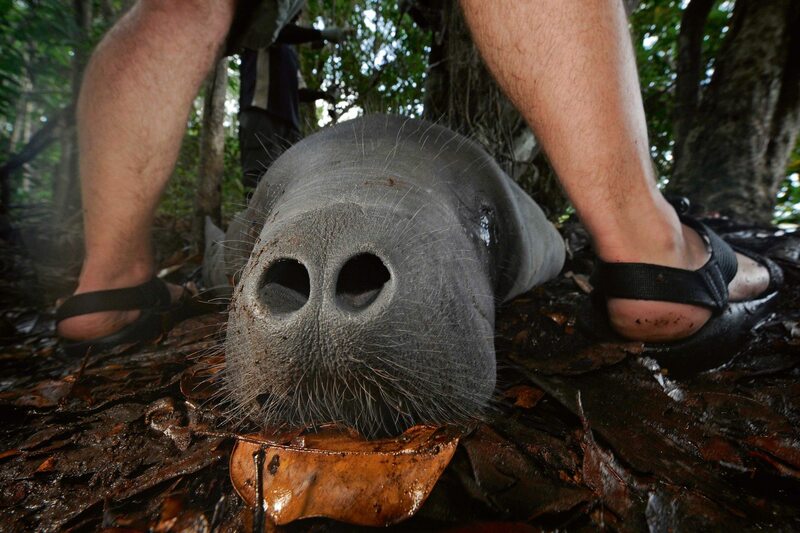 Two years later, 17 hunters are part of the programme and all 14 manatee traps in the area have been removed. The former hunters now have 14 sustainable catfish aquaculture cages and have already sold more than one tonne of fish, using some of the proceeds to keep their aquaculture business going. The year before the project began, this community killed 133 manatees; the year after, it killed none. Three additional communities in the area and manatee researchers in other countries have now also requested this training so that they can provide a viable alternative to manatee hunting. 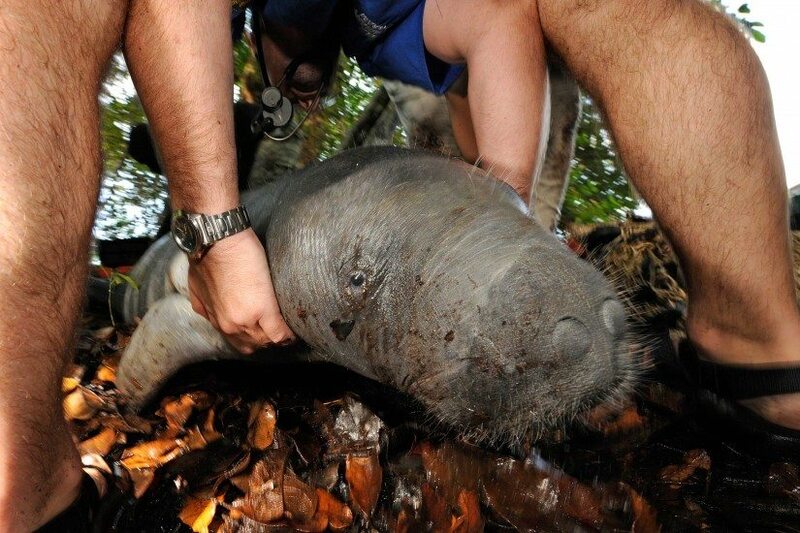 Once the manatee network has raised the necessary funds, we will expand this programme. A postage stamp from Niger in 1962 depicts an African manatee. The species has featured on the stamps of 12 countries, including some (Central African Republic, São Tomé and Rwanda) where it is not found. It seems that people are so fascinated by this mysterious sirenian that they want to claim it as their own.